A Surprise in Texas Preview A Surprise in Texas: The Thirteenth Van Cliburn International Piano Competition features the finalists vying for the 2009 competition's coveted gold medal. The Van Cliburn International Piano Competition has been called "the most prestigious classical piano contest in the world" by the Chicago Tribune and "the musical Olympics of the western world" by the Milwaukee Journal. PBS presents A Surprise in Texas: The Thirteenth Van Cliburn International Piano Competition, featuring the finalists vying for the 2009 competition's coveted gold medal. The winners of the Thirteenth Van Cliburn International Piano Competition. Twenty-nine of the world's best young pianists hailing from fourteen countries converged in Fort Worth, Texas, in May 2009 for a once-in-a-lifetime chance at gold in the Thirteenth Van Cliburn International Piano Competition. Emmy Award®-winning director Peter Rosen followed these distinctive personalities during a rigorous three-week competition—through intense rehearsals, introspective moments, preconcert rituals and endearing celebrations. With performances of Chopin, Liszt, Beethoven, Rachmaninoff and other composers setting the impassioned tone, the result is an intricate view into the inner workings of the world's most prestigious piano competition, and a heartwarming story that proves to be a momentous surprise in Texas. The documentary features Haochen Zhang of China, 19—the youngest competitor—as well as blind pianist Nobuyuki Tsujii, 20, of Japan and Yeol Eum Son, 23, of South Korea. The six finalists from the competition now have an unparalleled opportunity to perform throughout the United States, including more than 300 engagements coordinated by the Van Cliburn Foundation. In addition, the gold medalists will perform international engagements arranged by IMG Artists Europe. Collectively, the Cliburn winners will earn more than $1,000,000 during that time. About Peter Rosen Productions, Inc. Founded in the 1970s by producer/director Peter Rosen, Peter Rosen Productions, Inc. has made over 100 full-length documentary films and television programs on a wide variety of subjects. Five of these productions have won Emmys, and many others have been awarded the top prizes and honors at film festivals and competitions throughout the world. Peter Rosen has won the prestigious Directors Guild of America Award and a Peabody Award. His work has featured some of the most important figures in the arts including Leonard Bernstein, Martha Graham, Yo-Yo Ma, Beverly Sills, I. M. Pei and Garrison Keillor. Visit http://www.peterrosenproductions.com/. 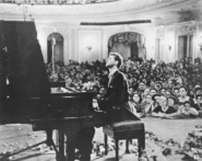 The Van Cliburn Foundation disseminates classical music worldwide, launches and nurtures young artists' careers through the quadrennial Van Cliburn International Piano Competition, the ensuing three-year international concert tour of its medalists, award-winning documentaries and a syndicated radio series dedicated to the competition and its most memorable performances. By making the competition available in its entirety on the Internet, the Foundation has extended its outreach to listeners in every corner of the globe. For audiences in the Dallas/Fort Worth Metroplex, the Van Cliburn Foundation promotes great music and world-class artists through the annual Cliburn Concert series. It reaches over 30,000 elementary school students annually with the Education programs of Musical Awakenings®. In 1999, it established the quadrennial International Piano Competition for Outstanding Amateurs™, which The Boston Globe proclaimed "a celebration of music, and the people who have to make music, no matter what." Visit http://www.cliburn.org/ to learn more about the Cliburn as it approaches the 50th anniversary of the Van Cliburn International Piano Competition in 2012. Van Cliburn at the Moscow Conservatory following his historic win at the first International Tchaikovsky Piano Competition, 1958. Van Cliburn's mother, Rildia Bee O'Bryan Cliburn, was trained at the Julliard School in New York, and began teaching her son when he was age three. He spent most of his childhood in Texas, until age 17, when he went to Julliard. Six years later, Van Cliburn was the most famous pianist in the world. He was inducted into the American Classical Music Hall of Fame, and has received the Kennedy Center Honors Medallion and the Presidential Medal of Freedom, among many other awards. The Van Cliburn International Piano Competition, held every four years, was started in 1962 to nurture the development of young artists. KERA is the presenting station for A Surprise in Texas: The Thirteenth Van Cliburn International Piano Competition. KERA is a not-for-profit public media organization that serves the people of North Texas. The station broadcasts to the fourth-largest population area in the United States. KERA produces original multimedia content, carries the best in national and international public television and radio programs, and provides online resources at http://kera.org/. The station's extensive coverage of the arts can be found at http://artandseek.net/. KERA TV broadcasts on Channel 13.1. WORLD broadcasts on 13.2. KERA FM broadcasts on 90.1 in Dallas/Fort Worth/Denton, 88.3 in Wichita Falls, 100.1 in Tyler and 99.3 in Sherman. KERA's new music station KXT 91.7 FM is also streamed online at http://kxt.org/. © 2015 The Van Cliburn Foundation. All Rights Reserved. Text by Deborah Johnson. Photos courtesy of Van Cliburn Foundation/Altré MEDIA.